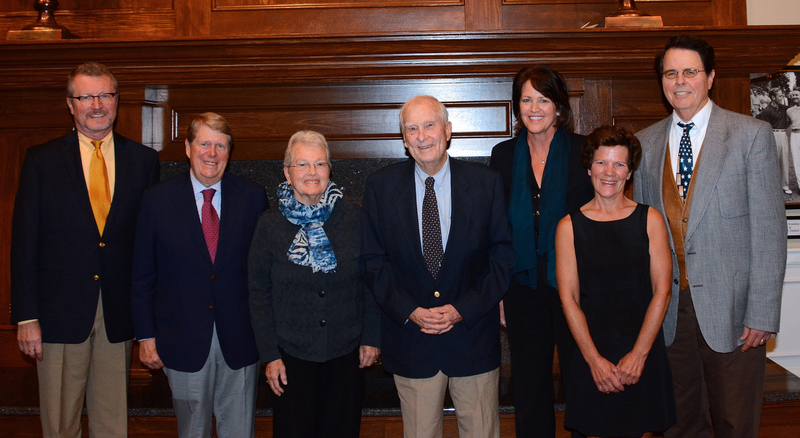 On Friday, October 20, the Ottawa Hills Schools Foundation presented the inaugural class of Ottawa Hills Local Schools Distinguished Alumni. The award recognizes Ottawa Hills graduates who have made or are making a meaningful contribution to society and whose accomplishments, affiliations, and careers have honored the tradition of excellence at OH. Inductees and their representatives (pictured left to right below): Former OH art teacher Steve Wipfli, who accepted the award on behalf of the late Richard DeVore (’51), worldrenown ceramicist; Russell Carson (’61), businessman and community leader; Mrs. Ellen Staelin, who accepted the award on behalf of her late husband, David Staelin (’56), MIT professor and co-discoverer of the Crab Nebula pulsar; John Galbraith (’41), long-time Ohio legislator and the last surviving member of Ottawa Hills’ first graduating class; Christine Brennan (’76), award-winning national sports journalist; Sally Stuckey (’74), technology innovator; and Craig Burkhart (’69), leader in dermatological medicine, author of numerous medical publications, and holder of multiple patents. Distinguished Alumni were inducted at a special ceremony held at Inverness Club and introduced during the half-time show of the Ottawa Hills/Toledo Christian football game. To nominate an individual for the 2018 Distinguished Alumni Award, click on the link below to download the Nomination Form. Nominations may be emailed to Erica Silk at esilk@ohschools.org or printed and mailed to: Ottawa Hills Schools Foundation, 3600 Indian Road, Ottawa Hills, OH 43606. Nominations must be received by May 1st to be considered for this years award process. Please contact Erica Silk with any questions at 419-214-4838.